Shown above is the 3-dimensional radiation diagram for a 9-element Yagi antenna that the author once used to receive channel 12. To interpret this diagram, imagine that the antenna is at the origin. The length of a line from the origin to any point on the surface is proportional to the gain in that direction. 2-dimensional pattern diagrams are more common. The following two diagrams describe a Channel Master 4228. Reflector antenna - Radio waves will reflect off of a large conducting plane as if it was a mirror. A coarse screen will work just as well. The reflector eliminates most reception from the rear while at least doubling the forward gain. Reflector antennas are very common. The screen reflector shown above has the gain of about 4 dipoles. The parabolic reflector focuses the signal onto a single dipole, but its bandwidth is a little disappointing. The corner reflector has a little less gain but much greater bandwidth. The corner reflector has roughly the gain of three dipoles. It is a good medium gain antenna, widely used for UHF. If you need more than 25 dBi then the paraboloid dish is the only practical choice, but for VHF or UHF they are huge. Rotors (antenna rotators, motorized antenna aimers) - When a highly directional antenna is employed, a rotor becomes necessary when the desired stations are in multiple directions. A rotor is a minor nuisance for analog stations, but it becomes a major problem for digital stations. This is because it takes 10 times longer to discover the correct aim for a DTV station. (Instead of simply looking at the level of snow, you must count the dropouts that occur over a half-minute period, then re-aim and try again.) The author discovered that for weak stations it took him 5 to 10 minutes to achieve the optimum aim, and during that time he missed about half the program dialog. Because of this he quit using that antenna. For an ideal rotor, the antenna would always point where the indoor controller indicated. But the Radio Shack rotor the author was using suffered “creep”, a small directional error accumulation. The creep would build up fastest during the short jerky movements typical during station searches, and soon the antenna would be pointing far from where the dial said, making the dial calibrations useless. The author later switched to the Channel Master rotor that has an infrared remote control. This rotor doesn’t seem to suffer as much creep, but then, this antenna isn’t used very often. But it can creep. The controller has a microprocessor that counts the number of times the rotor is used. After a certain number, the controller will recalibrate to eliminate the accumulated creep. It does this by rotating the antenna to the limit in one direction, then to the limit in the opposite direction, and then to the requested channel direction. If you must have a rotor, get one like this (or one that doesn’t creep in the first place). If you like TiVo then you will not want a rotor. TiVo-like recorders can’t make antenna adjustments. This author recommends that if your stations are in just two directions, you will be happier with two antennas. A common splitter can be used to combine the two antennas. Doing this will cost you a lot of signal strength (Half of the signal from each antenna gets rebroadcast out the other antenna. Figure a 3.5dB loss at the splitter.). A Join-Tenna is a device that can avoid this loss. Another way to avoid the 3.5 dB loss is to use an antenna switch to combine the two antennas. The author likes the Radio Shack 15-1968 switch, which has an infrared remote control. But again, the TiVo can’t work the switch. Servo motor - This is a small motor in a C-band dish feed assembly. This motor selects whether vertical or horizontal polarization is to be received. 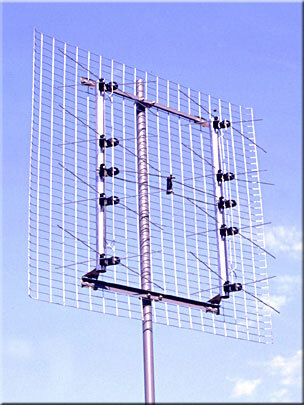 Single channel Yagi - The ultimate antenna for VHF is a single channel Yagi. No other type has as much gain. But these are large antennas, and they work well for only one channel, so these are desperation antennas. Reasonably priced single channel Yagis are available from Wade. See “Stores and websites supplying antenna equipment ”. See http://www.wade-antenna.com/Wade/cutchannel.pdf on the Wade website. See also Join-Tenna. S/N (Signal to Noise Ratio) - Whether a signal is receivable is determined by the signal to noise ratio. Noise management is discussed at http://www.hdtvprimer.com/ANTENNAS/basics.html . If you do not manage the noise properly, you might be throwing away a sizable portion of the antenna signal. Splitters/Combiners/Diplexers - A splitter is a sort of “Y-adapter”. All splitters are bi-directional, and thus will serve also as combiners. These devices are usually 85%-95% efficient, whether used as splitters or combiners. There are four basic types. They look almost identical, but are very different devices. 900MHz-2200MHz splitter/combiner - These can be used with satellite systems, but be sure you know how control issues will be resolved. Satellite/OTA diplexer - This device will allow a satellite dish and an over-the-air antenna to share the same cable. The loss in the device will not be 3dB, but there will be some small loss. Check for whether DC is blocked to the OTA port. Satellite/OTA diplexers will not work with the new 5-LNB dishes from DirecTV. Note: Splitters in cable systems with “on demand” features must pass 5MHz-900MHz. Stacked antennas - The use of multiple antennas is called stacking or ganging. The antennas must be identical. Dipoles are commonly stacked horizontally (collinearly), vertically (broadside), and in echelon (end-fire). When dipoles are stacked horizontally, the horizontal beam-width becomes very narrow. This is because they do not add in-phase for directions not straight ahead. Similarly, when stacked vertically, the vertical beam-width becomes narrower. The same principles apply when stacking whole antennas, not just dipoles. 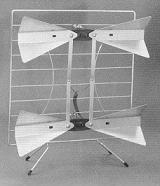 See “The two antenna trick” at http://www.hdtvprimer.com/ANTENNAS/silver.html . Standing waves, SWR - If a transmission line ends in nothing (either an open or a short), 100% of the signal gets reflected back toward the source. The forward moving signal and the backward moving signal pass through each other without affecting each other. But at each point in the line the two signal voltages add together, and considering phase, some places they will subtract. The result is a stationary voltage pattern, called a standing wave, arrayed along the transmission line. If an incomplete load (something other than 75 ohms) causes less than a 100% reflection, then the standing wave pattern doesn’t show complete cancellation. The ratio of the highest and lowest voltages that can be found along the line is called the Standing Wave Ratio (SWR). An SWR of 1 is good: There is no reflected signal. An SWR of infinity is bad: There is total reflection. An SWR of 1.5 is not too bad. There are formulas that will predict the SWR if the load impedance is known. Stores and websites supplying antenna equipment - None of the vendors listed here has contributed financially or materially to this website or this author. · Terk – Severe hype. The equipment works, but Terk marketing prevents intelligent decision-making. * Blonder Tongue makes CATV antennas, which are slightly more rugged and more expensive than consumer grade antennas. ** Wade is presently the only maker of inexpensive VHF single channel Yagis. Wade sells only through distributors, but the distributors don’t stock much. Lafayette Electronics will ship you one UPS (Email Betty at sales@lafayetteelectronicsupply.com ). Otherwise you must go to the Wade website, find your local distributor, call him and order the antenna, and the antenna will be shipped out of Ontario. Assume 2 weeks. You will probably have to drive to the store to pick it up. While Wade sells full lines of TV antennas for CATV and consumers, other vendors are easier to deal with. Terminators for 75-ohm lines - A 75-ohm transmission line must end in a load resistance equal to 75 ohms or much of the signal will be reflected backwards, possibly getting retransmitted out the antenna. Signals can literally bounce back and forth inside transmission lines. All TVs and amplifiers have 75-ohm inputs, so normally there is no problem. If you use a splitter but forget to connect one output to anything, some of the signal will be reflected back towards the antenna. Viewers of the connected TV might discover some stations seem to be missing. The reflected signals can increase the likelihood that the amplifiers will overload. These problems can be insignificant, or they can be more confusing than significant. Getting 75-ohm terminators and connecting them to the unused outputs of the splitter will stop the reflections. Tilt angle - If the skyline (including the tree tops) is a few degrees above horizontal, you will benefit from tilting the antenna up to point at the skyline, although for low-gain antennas this benefit is insignificant. If your visible skyline is many miles away, this signal might arrive at different elevation angles on different days. Some authors will recommend a tilt motor so that you can always maximize your signal strength. But this author believes that high-angle days are always strong signal days and the minor improvement in tilting the antenna up is not necessary. This author recommends a tilt motor only when a rotor is employed and the skyline angle is different in different directions. All high frequency transmission lines have a property called characteristic impedance. Twin-lead is usually 300 ohms, while coaxial cable for TVs should always be 75 ohms. (50-ohm coaxial cable is also common. Avoid that cable.) Although rated in ohms, this has nothing to do with resistance. A resistor converts electric energy into heat. The “75 ohms” of a coaxial cable does not cause heat. A transmission line must end in a load resistance equal to the line’s characteristic impedance in order to prevent signal reflections in the cable. But coax also has ordinary resistance (mostly in the center conductor) and thus loses some of the signal, converting it into heat. The amount of this dissipation (loss) depends on the frequency as well as the cable length. Trees as obstructions - A tree has very little effect on VHF-low, but a significant effect on VHF-high. But the big problem is UHF. A tree with leaves blocks about 90% of a UHF signal. The space behind the tree is an overlap of the signal going through the tree and the signal diffracting around the tree. Such overlapping fields have an alternating pattern of strong and weak spots separated by only a few feet. An antenna in a strong spot might work nicely until the wind blows, deforming the tree and moving the spots. Thus, for DTV stations, you are likely to see dropouts when the wind blows. Even in a good-signal neighborhood it is inadvisable to put a UHF antenna behind a tree. If the tree loses its leaves in the fall, reception behind it will improve dramatically. Many people get a TV for Christmas, and erect an antenna for it in January, and then wonder why it quit working in May. It’s the trees. The farther away a tree is, the less of a problem it is. For far away trees, assume no signal penetrates the tree, and reception will be by diffraction around the tree. See Diffraction. Trees block 100% of satellite signals. Turnbuckle - This is a device for tightening guy wires. Since one side has left-handed threads, a turnbuckle will tighten the guy wire without twisting it. 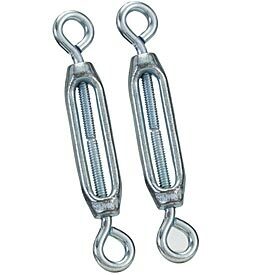 For the type pictured below, you must tape over the turnbuckle after adjusting it or vibration will cause it to loosen with time. For UHF, twin-lead should be kept at least an inch away from anything metal, and should not be allowed to touch anything dielectric (plastic). For VHF, the twinlead should not be allowed to touch anything metal, even if insulated, and should not lie against anything dielectric. UHF - The Ultra High Frequency spectrum is everything from 300 megahertz to 3.0 gigahertz. One of the bands within this spectrum is the TV UHF band, which goes from 470 megahertz (channel 14) to 806 megahertz (channel 69). Each of these stations occupies 6 megahertz of that spectrum. Velocity factor - Signals travel at the speed of light. However the speed of light inside a transmission line is slightly slower than the speed of light in a vacuum. It depends on the dielectric constant of the material holding the electric and magnetic fields. Most transmission lines employ polyethylene (PE) or a PE-air mixture. The speed of light in PE is 66% of the speed of light in a vacuum. The speed of light in air is about 100% that of a vacuum. A coaxial cable with solid PE between the conductors will have a velocity factor of 0.66. For twin-lead, the electric and magnetic fields are partly in the PE and partly in the air around the twin-lead. As a result, the velocity factor is somewhere between 0.66 and 1.00, usually around 0.90. PE is somewhat lossy at high frequencies. To reduce the loss, microscopic air bubbles (foam) are often blown into the PE of coaxial cables. This also raises the velocity factor to 0.75 or 0.85, but it makes the cable less rugged. The velocity factor is usually of no use to Average Joe installing a TV antenna. In the rare cases where the transmission delay is important, the velocity factor becomes important. Vertical antennas - There are countries where TV signals have vertical polarization, but not in North America. U.S. TV stations are allowed circular or elliptical polarization if they want. But fewer than 10% of U.S. stations do this. Most stations figure the vertical component of circular polarization is wasted power. See Polarization. If a local TV station uses circular or elliptical polarization then you can probably receive it reliably using either a vertical or a horizontal antenna. A vertical antenna can be a good choice if you want TV reception in a moving vehicle. 1. A quarter-wave vertical whip with 3 or 4 horizontal ground plane “radials”. This is a small version of the popular CB antenna. 2. A quarter-wave vertical whip that uses the metal roof or trunk lid as the ground plane. 3. A ¾-wave vertical whip with a coil in the middle. This is a scaled-up version of a popular cell phone antenna. 1. The TV VHF-low band. This band goes from 54 megahertz (channel 2) to 88 megahertz (channel 6). Watt, Kilowatt, Megawatt - A watt is a unit of measure that tells the rate at which energy is produced or consumed. A kilowatt is a thousand watts. A megawatt is a million watts. One watt is one joule per second. 745.7 watts is one horsepower. f is the frequency in megahertz. l is the wavelength in meters. Antenna elements are typically about a half wavelength long. Yagi antenna - A Yagi antenna has several elements arranged in echelon. They are connected together by a long element, called the boom. The boom carries no current. If the boom is an insulator, the antenna works the same. The rear-most element is called the reflector. The next element is called the driven element. All the remaining elements are called directors. The directors are about 5% shorter than the driven element. The reflector is about 5% longer than the driven element. The driven element is usually a folded dipole or a loop. It is the only element connected to the cable. Yet the other elements carry almost as much current. The more directors you add, the higher the gain becomes. Gains above 20 dBi are possible. But the Yagi is a narrowband antenna, often intended for a single frequency. 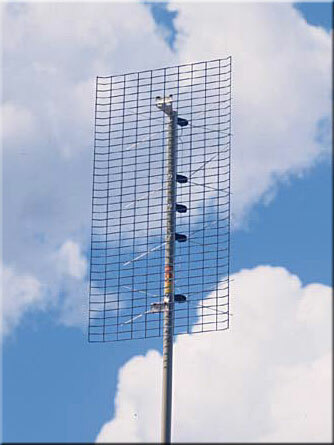 Yagi antennas are described in more detail at http://www.hdtvprimer.com/ANTENNAS/types.html . Yagi/Corner-reflector antenna - This antenna is a hybrid between a Yagi and a corner reflector antenna. The directors determine the gain on the high channels, while the size of the corner reflector determines the gain on the low channels. It attempts to be a wideband antenna, but in fact it does a mediocre job on the low channels. Although the Yagi/Corner-Reflector is not the best antenna, it is the most common UHF TV antenna, mainly because it can be mounted on the front of a VHF antenna without degrading the VHF antenna. 2-Bay antenna - This is a two dipole reflector antenna. It is UHF only. An indoor version is called the “Double Bow”. It has some flaws (a ribbon cable, poor matching on the low channels) and yet is still one of the better indoor antennas. Excellent outdoor 2-bays are now available: the DB-2 by antennasdirect.com and the 4220 by Channel Master. They are small enough to use indoors, and as such are presently the highest performing indoor antennas available. 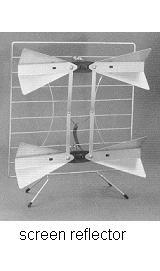 4-Bay antenna - This is a stacked dipole reflector antenna. It has a fan-shaped beam: very broad horizontally, very narrow vertically. An excellent antenna in the 20-30 mile range, a rotor is usually not needed. It is a bad choice where multi-path occurs. (Multi-path and ghosting result when the direct signal path is blocked.) 4-Bays are made by Channel Master, Winegard, Antennacraft, Wade, and Antennasdirect.com . This UHF only antenna is roughly 40”x18”. 4DTV - This is a digital satellite subscription service requiring an 8-foot motorized C-band dish. About 10 HD channels and 150 CD-quality SD channels are available. 8-Bay antenna - This is a stacked dipole reflector antenna. Its searchlight-like beam makes it very different from the 4-Bay. This highly directional high gain antenna is commonly thought to be the strongest overall UHF antenna. 8-Bays are made by Channel Master, Winegard, and Antennasdirect.com . The Winegard 8-Bay is skewed in favor of the low channels, and is presently the best antenna available for channels 14-30. (If you want an antenna skewed in favor of the high channels, select a big Yagi/Corner-reflector.) 8-Bays are roughly 40”x36”. 8-bays are intended only for UHF. However the Channel Master 8-bay will pick up channels 7-13 quite well.